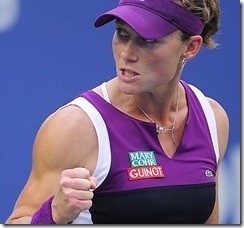 Samantha Stosur finished the US open in style beating the reigning American favourite Serena Williams. Stosur, 27, from the Australian state of Queensland beat Williams 6-2, 6-3 Sunday to become the first Australian woman in 31 years to win a major singles title. Williams was the hot favourite to win the cup but Ninth-seeded Stosur had other plans and beat Serena Williams on American soil. The match was won in one hour and 13 minutes in front of 23,000 people on Arthur Ashe Stadium. The match was not without controversy with Williams berating the chair umpire after receiving a one-point penalty for verbal hindrance. Williams called the chair umpire a ”hater”. ”If you ever see me walking down the hall, walk the other way,” she said.